Design Academy Eindhoven graduate Penny Webb has developed a lamp, a mirror and a textile that fluctuate in hue when subjected to different stimuli, even if they occur many miles away (+ movies). The objects in Penny Webb's Separate Togetherness collection are designed to interact with each other, helping people anywhere in the world stay in touch without necessarily having to communicate directly. Each home accessory is paired with a corresponding sensor embedded into a small object in a separate location, connected via Wi-Fi. When someone stimulates the sensor by breathing, stroking or moving past it, its partner product reacts by changing colour – reminding the owner of the other person. "On its own, the internet is a relatively lonely place void of human contact," said Webb. "The products each interact, and aim to engage your peripheral awareness as an alternative means of attaining distant closeness." A hanging ring lamp – made from polyurethane resin mixed with phosphorescent pigment and small ultraviolet (UV) LEDs – glows in response to changes in lighting detected by a secondary object consisting of a light sensor and wireless Arduino, a customisable micro-computer. Screen-printed onto fabric, a circular pattern of thermochromic pigment reveals layers of colours in response to a touch pad consisting of piezoelectric elements, which detects pressure when it is stroked. Finally, a thermochromic mirror cast in epoxy resin on a copper plate changes colour in response to a distant breath detected on a third remote object. "I wanted to escape as much as possible from what we perceive as 'technological objects' so I used combinations of smart materials to create the changing effect," said the designer. 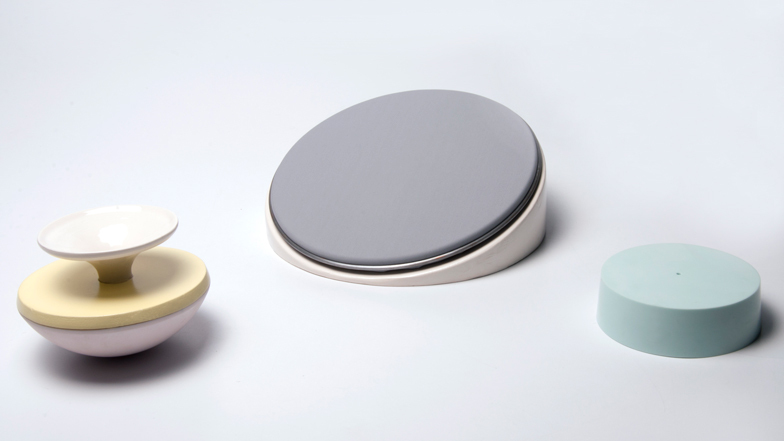 The products share a palette of pastel shades and a common circular form. The phosphorescent pendant lamp is a horizontal loop, the fabric is a large sheet with a circle in the centre, and the mirror is a wall-mounted circular surface. "The products aim to provide a subtle, somewhat subconscious change of appearance over time that communicates a distant presence," Webb said. "Something really important in the project is that it does not become a simulation of someone far away, but simply a suggestive presence." Separate Togetherness was Webb's graduation project from Design Academy Eindhoven and was shown at the degree show during Dutch Design Week in October.